One lovely spring day, an artist named Ted Warren draws the face of a frightened man with an oval around it. Why? He has no idea! He goes for a long walk and happens upon the home of Alex Kordova, a stone cutter who is carving Ted’s name on a new tombstone with the date of death as that very day! Why? He has no idea! Coincidentally, the frightened man drawn by Ted happens to be Kordova! Neither man thinks that these events signal “Impending Doom!” but when Ted realizes that Kordova’s wife is none other than Ted's old flame Ellen, it’s not long before the two are back in each other’s arms. Kordova beats Ted to death for kissing his wife and both prophecies come true—Ted dies that day and Kordova meets the hangman, demonstrating that the oval around his face in Ted’s drawing represented a noose. Craig can do so much with wordless panels. The GCD credits the story to Feldstein but I’ll bet that this is all Craig. The story is decent enough but, once again, Craig blends art and story to make the whole more than the sum of its parts. “Rx . 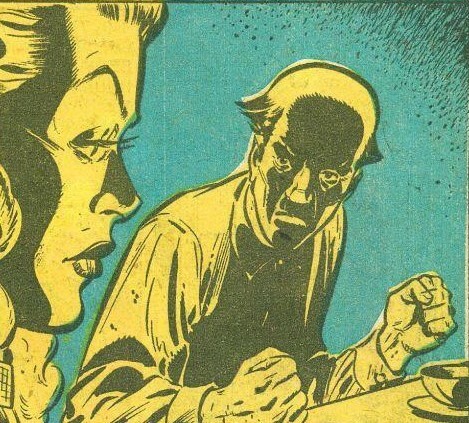 . . Death!” shows that Ingels couldn’t draw normal people on a dare. 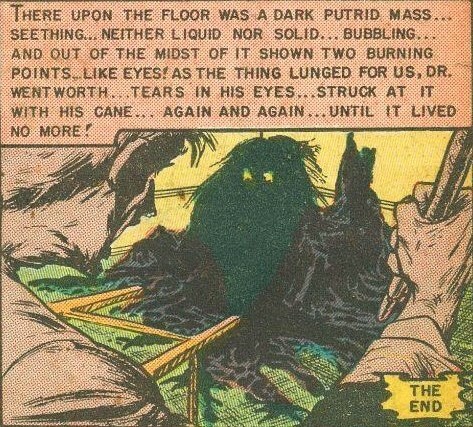 The story is an uncredited adaptation of Arthur Machen’s “The Novel of the White Powder,” and here a man takes an unknown drug from an old pharmacist and finds his entire body digesting itself. 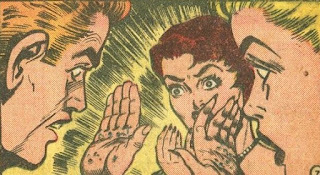 Jack Kamen’s Archie Andrews-like art makes “A Fatal Caper!” even weirder than it might have been in other hands, as two couples seem to play around with a book of spells but end up finding out that it’s not a good idea to mess with a corpse. Peter: The indispensable Tales of Terror: The EC Companion by Fred von Bernowitz and Grant Geissman informs me that "Rx . . . Death" was inspired by Arthur Machen's "The Novel of the White Powder," and Wikipedia tells me ". . .White Powder" inspired H.P. Lovecraft. Not having read any Machen, I naturally assumed "Rx . . . Death" was an homage to Lovecraft. Not a very good one, though. Ghastly's art hits both highs and lows (his two main male protagonists seem to switch faces halfway through the story) and the whole thing doesn't so much end as run out of panels. I didn't need Mssrs. 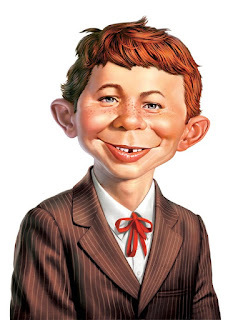 Geissman and von Bernowitz to tell me that "Impending Doom" was based on W.F. Harvey's "August Heat," as I've heard the classic 1945 Suspense radio adaptation (starring Ronald Colman) numerous times over the years. The first two stories this issue are instantly forgettable, with "A Fatal Caper" at least supplying a few (I assume) unintentional laughs. The list of ingredients for Marylyn's brew is hilarious. Where, in a time before Wal-Mart, would one shop for "moss from a dead man's grave" (as opposed to a live man's grave), "the hair of a baby mouse," and "nails of a dog born dead?" 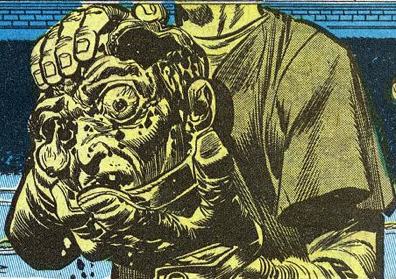 Jack: Didn't we read "August Heat" in one of the DC horror comics, with art by Alcala? Peter: Good catch, Jack. We did. 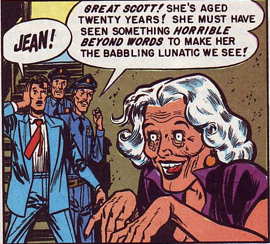 It was in Secrets of Sinister House #12 (July 1973). Oops! Never mess with a corpse that has the plague. Jose: “Rx… Death” and “Impending Doom” are the standouts here, but it’s an only-just likable issue all around. The former seems like it’s just picking up a head of steam before it wraps up what could’ve been a goopy corker of an ending in a single panel, and Craig puts his economical style to good use, though some may find the story a little too reliant on coincidence and speedy in its developments. “The Thing from the Sea” isn’t too bad on a narrative level (F. Marion Crawford should know, as it’s based on his “The Upper Berth”), but Jack is right: Feldstein’s art is too static to generate much excitement. “A Fatal Caper” certainly isn’t a fatal bore, but it is pretty damn goofy, though this is the first time we’ve gotten to see Kamen step outside his comfort zone and play around with some supernatural batshittery. John: “Rx . . . Death" is my favorite pick of the litter for this month, thanks to the shadowy, digested creature Gregg evolves into. I thought it a uniquely creepy look. I thought "A Fatal Caper" was okay, with a nice ending living up to the EC tradition. The forgettable “The Thing from the Sea” lumbers along at the pace of the monster (that could have inspired the characters in "Something To Tide You Over" in Creepshow), and I thought “Impending Doom” was too silly when it was all said and done. Perhaps if Alex had hammered Ellen as well . . .
Four men board a mail boat bound for the mainland from the gloomy façade of Mephisto Prison. Only a few miles out, a special broadcast crackles over the airwaves: a deranged killer has made his escape from the island prison, and his only means of egress is the little mail boat. With the utterance of this proclamation, suspicion immediately rises in each man. Who is the killer? The mousy bookkeeper? The bulldog attorney? The young skipper? The gentleman visiting his convict brother? Apprehension is high when both the boat’s motor and radio are sabotaged in the confusion. A shotgun is discovered, its shells kept separately for everyone’s interest, nocturnal watches put in place. The bookkeeper makes a break across the sandbar where they’re moored, only to be gunned down by the attorney. He and the gentleman begin to scuffle and, when the latter comes out the victor, he meets the sight of two barrels pointed at him by the sparkling-eyed skipper. Gloating over his deceit, the murderous “skipper” heads out into the low tide for the shore. But it’s still two miles out, and when the moon begins to rise, so does the sea level, and guess who can’t swim? I liked Craig’s “Murder May Boomerang” better when it was on Alfred Hitchcock Presents. “Revenge” kept things far more precise and was the better story for it. Craig, in attempting to distance himself from Samuel Blas’s original for obvious legal reasons, unintentionally makes the central relationship (husband and wife in Blas’s, here father and son) a bit of an overwrought parody. Our hero and his father love each other… a lot. This wouldn’t be so bad, would be pretty heartbreaking if handled right, if the two of them didn’t burst into tears almost every time one of them shows kindness and weren't constantly saying how much they care for each other. A different time with different sensibilities, perhaps, but these guys are too sugary-sweet to be taken seriously as humans, let alone characters. Craig also writes himself into a corner when he makes his attacker a vicious, well-known criminal who disguises himself in the son’s very own hunting clothes to escape. So we’re forced to believe that in the son’s rage he did not A) listen to the radio broadcast’s physical description of the convict or B) know what his own wardrobe looked like. Either of these would have helped him greatly in not killing an innocent man, but then we wouldn’t have had a story. “Death’s Double-Cross” also seems a little overly-complicated. Wouldn’t it seem much more natural for Ronnie to kill his identical twin John and then proceed to live his brother’s life, enjoying the spoils of his wealth and the woman he left years before, instead of reemerging after a respectable period of mourning to wed his brother’s widow? Doesn’t that seem the more suspicious thing to do? The only thing crossed here were my eyes, though Wood shows with this story that his art is really starting to come into its own. Peter: In the grand scheme of things, Crime SuspenStories falls somewhere in the middle of the EC line as far as quality goes but somewhere near the bottom of the heap of the core titles in terms of respect. There aren’t many essays written fondly recalling CSS; most critics (and readers, for that matter) prefer its vastly superior sister title, Shock SuspenStories. That could be because most of the issues of CSS seem, at times, to be slapped together in a hodgepodge of artists and sub par storytelling. 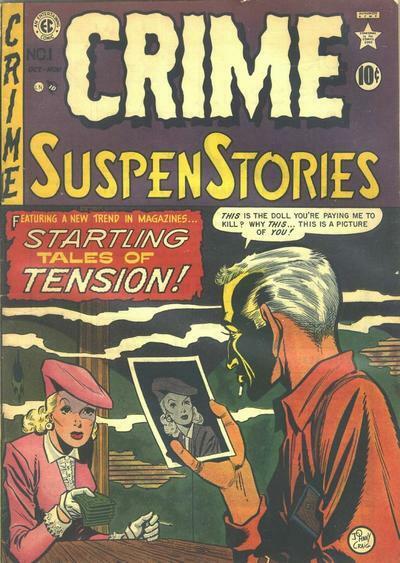 As with the other EC titles, the CSS writers enjoyed “dipping into other sources,” which led to borrowing liberally from such stories as Samuel Blas’s “Revenge” (morphed into this issue's “Murder May Boomerang” ). 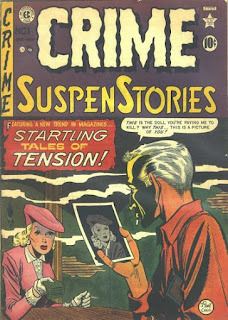 Thankfully, Bill and Al ignored the "True Crime" craze that had enabled titles such as Crime Does Not Pay and Justice Traps the Guilty to sell millions of copies a month and focused on literary bloodshed. Doubtless, Johnny Craig was confident his audience had no knowledge of the Blas story (and its true ascendancy to classic status would not occur until half a decade later when it became the first episode of Alfred Hitchcock Presents) and could pull a fast one without anyone noticing. It wasn't the last time "Revenge" would be adapted for the pre-codes; the October 1953 issue of Harvey's Witches Tales featured a grimmer and more violent version, one that pushed the envelope further than "Boomerang." If there's one major complaint I have with "Boomerang," it's that Johnny doesn't know when to let go. Whereas the original source material also ended with the realization that an innocent man had been murdered, the reader (and later viewer) was left to ponder the incident; Johnny feels the need to tack on a wordy expository spelling out just what happened in case we don't get it. 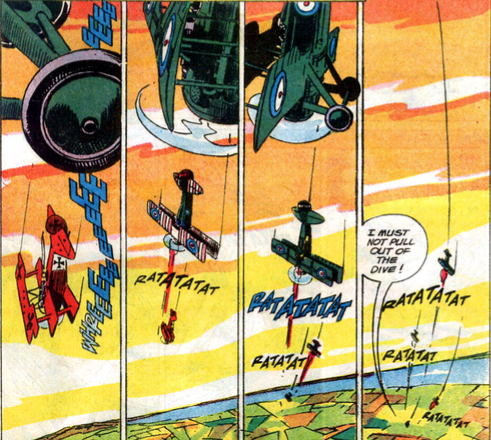 "High Tide," with its stark, sometimes cartoony Kurtzman graphics, is easily the high point of the issue. The smile on the Skipper's face as he unloads both barrels into the surviving hood is truly chilling. Jack: “High Tide!” is my favorite, both for Kurtzman’s wildly inventive art and the suspense that builds as we wonder which man is the killer. “Murder May Boomerang” gradually revealed its source as I read it, though I haven’t yet read the original story and only know the TV version from Alfred Hitchcock Presents. Wally Wood’s art is a joy to behold on “Death’s Double-Cross,” but the lack of any real ending felt like a cop out. It’s odd to see Ingels draw a non-horror story, but “A Snapshot of Death!” builds suspense nicely and features a great half-splash of a skull. Good work all around on this debut issue. John: I enjoyed “Murder May Boomerang,” and while I'm sure I've seen that episode of AHP (as the story rang a familiar chord once I hit the twist), I had since forgotten it until reading this tale. Clearly I'm not as well versed in the show as my fellow EC brethren. “Death’s Double-Cross” suffers from the cardinal sin of failing to provide an ending (I double-checked to confirm there wasn't a printing error in my Archive edition). What's funny about that one is I was quite prepared for John's shambling corpse to return to take revenge. At least that's how it would have gone down in one of CS's companion books. Right up to the ending—shoddy artwork and all—I thought “A Snapshot of Death” was going to be my favorite story in the issue, but Feldstein pulled his punch and let Jean live. Boo! I've yet to really warm up to Kurtzman; I thought "High Tide!" was just okay. The in-fighting aboard the ship played out as I had expected, though I have to give him credit for serving up an ending I wasn't anticipating (sometimes it helps to not pay attention to the story titles). Horror writer Henry Davidson finds it extremely hard to find the peace and quiet to write his tales when his friends won't stop partying at his place 'til dawn. Henry gets the bright idea of buying a haunted house in the countryside, a place none of his friends will find. That's the plan, anyway, but very shortly after setting up shop, Henry's buddies come a-callin'. Disgusted, the writer heads off, and his crew gets a bright idea: if it's a haunted house Henry wants, it's a haunted house he'll get. They rig up speakers around the house and then hide. When Henry gets home, they start their act; the ruse works and the terrified man runs form the house, straight to the police. Unfortunately for Henry's chums, the real ghosts decide to put in an appearance and they're not amused by the parlor tricks. Henry returns with the authorities to find corpses and insanity. Henry decides to head back to his old pad. Johnny Craig's "Horror House," though similar in some ways to "Television Terror" (Haunt of Fear #17), is a fabulous little yarn that strolls along at an almost jovial pace and then lowers the boom with a climax that is momentarily grim and then humorous again. Craig loves his cigarette-smoking men, doesn't he? As in "Television Terror," the spectres are left to the imagination of the reader; only the after-effects are witnessed. A science experiment goes horribly wrong and a very hungry blob emerges from the wreckage. If Al Feldstein's "Terror in the Swamp" sounds familiar, that's because it's a retitling of "The Thing in the Swamp!" 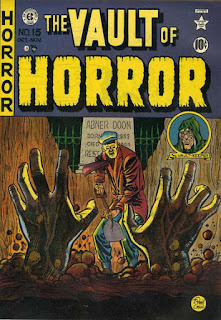 presented in Haunt of Fear #15 (published only six months prior! ), with a new intro and outro from The Old Witch. How many little kids read this and didn't even realize it was a rerun? 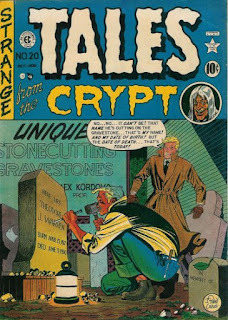 "Report from the Grave" is an awful, quasi-supernatural tale with a lame, Scooby-Doo expository. If Warren Lake wants to join "The Vault-Keeper's Club," he'll have to dig up the body of the recently-deceased Willy Balm, his predecessor in the club. The head honcho of the vault-keepers, Fred Coombes (who is also an undertaker! ), set a time on Willy's watch and Warren must bring back the exact time in order to gain access to this kooky bunch. When he digs up the grave (in a three-piece suit, yet!) 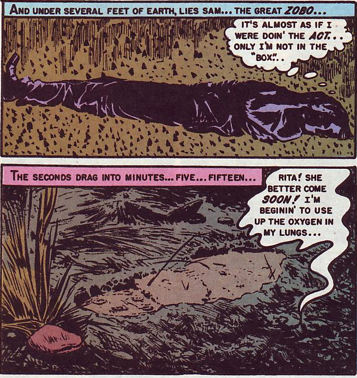 and opens the coffin, he finds nothing but bones, decomposition not usually found in a body only buried recently. Turns out fellow member Vardy poisoned poor Willy for stealing his girlfriend and ruining his life. He buried Willy somewhere else in the graveyard. At that moment, one of the graves gives off a puff of smoke and Vardy is hauled away for murder. When his fellow members ask what's up with the sign from the grave, Coombes allows as how he might not have cut enough holes in the coffin and the natural gases blew the lid off the coffin! Now, I'm no scientist but would there really be a blowhole tantamount to Old Faithful from some natural gases released from a corpse? Regardless, this dreadful drudge is probably never mentioned when talking about the great old days of EC. Jack: Once I got over the shock of the reprint from five months before, I was able to sit back and enjoy “Buried Alive!” which is my favorite Ghastly story to date. It has three things I like to see in a horror tale: a carnival setting, quicksand, and someone getting buried alive. What’s not to like? The Kamen story is below average even for him, while the Craig story is nothing new from the plot standpoint but features especially sharp art. Jose: Like Peter, I also enjoyed the lighthearted nature of “Horror House” and think it worked greatly in the tale’s favor when it took a hard left turn into grimmer territory. “Buried Alive” was a harmless affair, but I recall that the tropes that Jack enjoyed so much were put to better use in later stories. “Report from the Grave,” with its gassy corpse blowing up the cemetery, has a climax worthy of its overall quality. “Terror in the Swamp” seems familiar. I think I might have read it before. 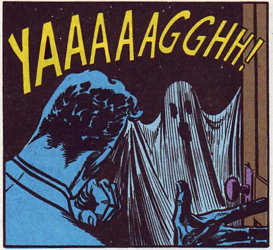 John: I think the readers are asked to accept an unbelievable premise in "Horror House." Since when can someone writing horror stories as a career afford to buy a new house on a whim? While it was a fun story overall, and the fate of the pranksters was pretty cool, I can't help but feel that we were short-changed. Sure, we're told the house is haunted, but we don't see Henry experience anything before his friends start playing tricks on him. So we're left with no explanation for the grisly shape his comrades are left in. The most interesting story plays out off-screen. Here's what I said about "The Thing in the Swamp" a few months back: I had higher hopes for "The Thing in the Swamp," but that's my fault for expecting more Heap/Swamp Thing/Man-Thing than Blob. Hey, if they can crib prior issues, I figure I should be able to as well. "Report from a Grave" starts off with a great premise, but sadly, as Peter points out, goes the Scooby-Doo route. Fortunately, ending with an exploding corpse will lift any story up a few notches. I think I would have appreciated "Buried Alive" more if I wasn't asked to believe that a nail through a jacket wouldn't rip before pulling a grown man into quicksand. He's Back! The Ace You Love to Hate! In the 77th Issue of Star Spangled DC War Stories!